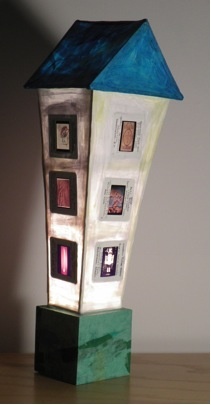 Art History Birdhouse was created using papier-mâché and basswood with obsolete 35mm slides. The slides were discarded by a local college library in conjunction with the dissolution of the college’s graphic design program. I once used the slides to support my Art History lectures, but now repurpose them as windows into this light-box birdhouse. By choosing slides of historical and modern bird imagery to construct a human style house, I am commenting on human anthropomorphic tendencies, while exploring how technological shifts endanger and/or make extinct previous modes of communication.